Earlier this week, the New York State Attorney General issued cease-and-desist letters to GNC, Target, Walgreens and Walmart requiring them to pull store brand nutritional supplements from their shelves (specifically herbals), based on the results of DNA testing. The products tested included Echinacea, garlic, ginkgo, ginseng, saw palmetto, St. John’s wort and valerian (the full press release can be found here). The cease-and-desist letters were issued as a result of allegedly finding that only 21% of the store-brand supplements contained DNA from the plant listed as the source on the label. Is the Consumer Reaction Justified? You’ve seen the reaction already – the Twittersphere is being flooded with retweets of every major news outlet's coverage, others are skewing the original press release implying this is the case with MANY supplements. Facebook newsfeeds are filled with friends warning each other to stay away from these retailers entirely, and manufacturers are stepping up to defend their products. Do consumers have the right to be concerned? Of course (given the information that’s been provided). This disclaimer is not meant to downplay the severity, however, based on the information that’s been released it’s clear that in this case, the testing is flawed, and more information is needed before the actions can be fully justified. All Supplements are NOT Equal. Labels Will Never Be Enough. Truth in labeling has received a lot of attention and action over the years - and rightfully so. However, there will always be limitations to what can be put on a product label. Often the words or logos and certification images don’t provide enough context for what it actually means. Consider the recent confusion and misuse of “natural”, “all-natural” and “100% natural” – terms that have been used for years on FDA approved products; or Jimmy Kimmel’s recent street interviews to see how many consumers know what a “gmo” product is. Unfortunately, it’s not the full context of what labels can, and cannot, tell you about a product that gets the attention of mass media. It’s up to the consumer, to question, and look beyond the label. 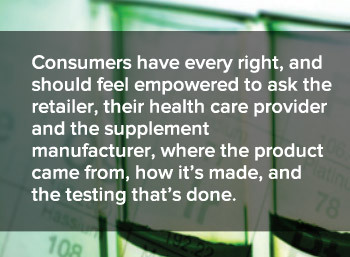 Consumers have every right, and should feel empowered to ask the retailer, their health care provider and the supplement manufacturer, where the product came from, how it’s made, and the testing that’s done. Our ask, to our customers, and all within the industry, is to continue in helping to disseminate accurate, unbiased information regarding labeling, and product quality. Not just in supplements, but for every single product that is brought into our homes. 2/6: FDA confirms that they agency does not use DNA barcode testing technology as a method for plant identification. Additional media channels reach out with speculation regarding the testing methods. 2/7: In light of the report results not being released, United Natural Product Alliance (UNPA) has launched its own investigation to test the products through third-party labs, and to publicly share the results. 2/12: A number of class action lawsuits against the four retailers have been filed in numerous states and the District of Columbia. Herbal Supplement Controversy: Did NY Investigation Use the Right Tests?